Horseshoe crabs are marine and brackish water arthropods of the family Limulidae, suborder Xiphosurida, and order Xiphosura. Their popular name is actually a misnomer, for they are not true crabs. Horseshoe crabs live primarily in and around shallow coastal waters on soft sandy or muddy bottoms. They tend to spawn in the intertidal zone at spring high tides. They are commonly eaten in Asia, and used as fishing bait, in fertilizer and in science (especially Limulus amebocyte lysate). In recent years, population declines have occurred as a consequence of coastal habitat destruction and overharvesting. Tetrodotoxin may be present in Carcinoscorpius rotundicauda. Because of their origin 450 million years ago, horseshoe crabs are considered living fossils. A 2019 molecular analysis places them as the sister group of Ricinulei within Arachnida. Horseshoe crabs resemble crustaceans but belong to a separate subphylum of the arthropods, Chelicerata, and are closely related to arachnids. Horseshoe crabs are closely related to the extinct eurypterids (sea scorpions), which include some of the largest arthropods to have ever existed, and the two may be sister groups. (Other studies have placed eurypterids closer to the arachnids in a group called Metastomata.) 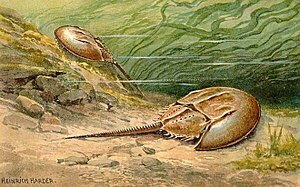 The earliest horseshoe crab fossils are found in strata from the late Ordovician period, roughly 450 million years ago. The entire body of the horseshoe crab is protected by a hard carapace. It has two compound lateral eyes, each composed of about 1,000 ommatidia, plus a pair of median eyes that are able to detect both visible light and ultraviolet light, a single endoparietal eye, and a pair of rudimentary lateral eyes on the top. The latter become functional just before the embryo hatches. Also, a pair of ventral eyes is located near the mouth, as well as a cluster of photoreceptors on the telson. The horseshoe crab has five additional eyes on top of its shell. Despite having relatively poor eyesight, the animals have the largest rods and cones of any known animal, about 100 times the size of humans', and their eyes are a million times more sensitive to light at night than during the day. The mouth is located in the center of the legs, whose bases are referred to as gnathobases and have the same function as jaws and help grind up food. The horseshoe crab has five pairs of legs for walking, swimming, and moving food into the mouth, each with a claw at the tip, except for the last pair. Behind its legs, the horseshoe crab has book gills, which exchange respiratory gases, and are also occasionally used for swimming. As in other arthropods, a true endoskeleton is absent, but the body does have an endoskeletal structure made up of cartilaginous plates that support the book gills. They are more often found on the ocean floor searching for worms and molluscs, which are their main food. They may also feed on crustaceans and even small fish. Females are about 20–30% larger than males. The smallest species is C. rotundicauda and the largest is T. tridentatus. On average, males of C. rotundicauda are about 30 cm (12 in) long, including a tail (telson) that is about 15 cm (5.9 in), and their carapace (prosoma) is about 15 cm (5.9 in) wide. Some southern populations (in the Yucatán Peninsula) of L. polyphemus are somewhat smaller, but otherwise this species is larger. In the largest species, T. tridentatus, females can reach as much as 79.5 cm (31.3 in) long, including their tail, and up to 4 kg (8.8 lb) in weight. This is only about 10–20 cm (4–8 in) longer than the largest females of L. polyphemus and T. gigas, but roughly twice the weight. The juveniles grow about 33% larger with every molt until reaching adult size. Horseshoe crabs normally swim upside down, inclined at about 30° to the horizontal and moving at about 10-15 cm/s. 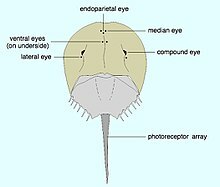 Horseshoe crabs have two primary compound eyes and seven secondary simple eyes. Two of the secondary eyes are on the underside. During the breeding season, horseshoe crabs migrate to shallow coastal waters. A male selects a female and clings to her back. Often, several males surround the female and all fertilize together, which makes it easy to spot and count females as they are the large center carapace surrounded by 3-5 smaller ones. The female digs a hole in the sand and lays her eggs while the male(s) fertilize them. 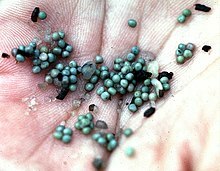 The female can lay between 60,000 and 120,000 eggs in batches of a few thousand at a time. In L. polyphemus, the eggs take about two weeks to hatch; shore birds eat many of them before they hatch. The larvae molt six times during the first year. Natural breeding of horseshoe crabs in captivity has proven to be difficult. Some evidence indicates that mating takes place only in the presence of the sand or mud in which the horseshoe crab's eggs were hatched. It is not known with certainty what is in the sand that the crabs can sense or how they sense it. Artificial insemination and induced spawning have been done on a relatively large scale in captivity, and eggs and juveniles collected from the wild are often raised to adulthood in captivity. Horseshoe crabs use hemocyanin to carry oxygen through their blood. Because of the copper present in hemocyanin, their blood is blue. Their blood contains amebocytes, which play a similar role to the white blood cells of vertebrates in defending the organism against pathogens. Amebocytes from the blood of L. polyphemus are used to make Limulus amebocyte lysate (LAL), which is used for the detection of bacterial endotoxins in medical applications. This means there is a high demand for the blood, the harvest of which involves collecting and bleeding the animals, and then releasing them back into the sea. Most of the animals survive the process; mortality is correlated with both the amount of blood extracted from an individual animal, and the stress experienced during handling and transportation. Estimates of mortality rates following blood harvesting vary from 3–15% to 10–30%. Approximately 500,000 crabs are harvested annually. Bleeding may also prevent female horseshoe crabs from being able to spawn or decrease the number of eggs they are able to lay. Up to 30% of an individual's blood is removed, according to the biomedical industry, and the horseshoe crabs spend between one and three days away from the ocean before being returned. Some scientists are skeptical that certain companies return their horseshoe crabs to the ocean at all, instead suspecting them of selling the horseshoe crabs as fishing bait. The harvesting of horseshoe crab blood in the pharmaceutical industry is in decline. In 1986, Kyushu University researchers discovered that the same test could be achieved by using isolated Limulus clotting factor C (rFC), an enzyme found in LAL, as by using LAL itself. Jeak Ling Ding, a National University of Singapore researcher, would go on to patent a process for manufacturing rFC; on 8 May 2003, synthetic isolated rFC made via her patented process was put on sale for the first time. Industry at first took little interest in the new product however, as it was patent-encumbered, not yet approved by regulators, and sold by a single manufacturer, Lonza Group. In 2013, however, Hyglos GmbH also began manufacturing its own rFC product. This, combined with the acceptance of rFC by European regulators, the comparable cost between LAL and rFC, and support from Eli Lilly and Company, which has committed to use rFC in lieu of LAL, is projected to all but end the practice of blood harvesting from horseshoe crabs. Horseshoe crabs are used as bait to fish for eels (mostly in the United States) and whelk, or conch. However, fishing with horseshoe crab was banned indefinitely in New Jersey in 2008 with a moratorium on harvesting to protect the red knot, a shorebird which eats the crab's eggs. A moratorium was restricted to male crabs in Delaware, and a permanent moratorium is in effect in South Carolina. The eggs are eaten in parts of Southeast Asia, Johor and China. A low horseshoe crab population in the Delaware Bay is hypothesized to endanger the future of the red knot. Red knots, long-distance migratory shorebirds, feed on the protein-rich eggs during their stopovers on the beaches of New Jersey and Delaware. An effort is ongoing to develop adaptive-management plans to regulate horseshoe crab harvests in the bay in a way that protects migrating shorebirds. Development along shorelines is dangerous to horseshoe crab spawning, limiting available space and degrading habitat. Bulkheads can block access to intertidal spawning regions as well. ^ a b Kōichi Sekiguchi (1988). Biology of Horseshoe Crabs. Science House. ISBN 978-4-915572-25-8. ^ a b c Stine Vestbo; Matthias Obst; Francisco J. Quevedo Fernandez; Itsara Intanai; Peter Funch (2018). "Present and Potential Future Distributions of Asian Horseshoe Crabs Determine Areas for Conservation". Frontiers in Marine Science. 5 (164): 1–16. doi:10.3389/fmars.2018.00164. ^ Smith, D.R. ; Beekey, M.A. ; Brockmann, H.J. ; King, T.L. ; Millard, M.J.; Zaldívar-Rae, J.A. (2016). "Limulus polyphemus". IUCN Red List of Threatened Species. IUCN. 2016: e.T11987A80159830. doi:10.2305/IUCN.UK.2016-1.RLTS.T11987A80159830.en. Retrieved 12 March 2019. ^ Attaya Kungsuwan; Yuji Nagashima; Tamao Noguchi; et al. (1987). "Tetrodotoxin in the Horseshoe Crab Carcinoscorpius rotundicauda Inhabiting Thailand" (PDF). Nippon Suisan Gakkaishi. 53 (2): 261–266. doi:10.2331/suisan.53.261. ^ David Sadava; H. Craig Heller; David M. Hillis; May Berenbaum (2009). Life: the Science of Biology (9th ed.). W. H. Freeman. p. 683. ISBN 978-1-4292-1962-4. ^ Ballesteros, J. A.; Sharma, P. P. (14 February 2019). "A Critical Appraisal of the Placement of Xiphosura (Chelicerata) with Account of Known Sources of Phylogenetic Error". Systematic Biology. doi:10.1093/sysbio/syz011. ^ a b Garwood, Russell J.; Dunlop, Jason A. (13 November 2014). "Three-dimensional reconstruction and the phylogeny of extinct chelicerate orders". PeerJ. 2: e641. doi:10.7717/peerj.641. PMC 4232842. PMID 25405073. Retrieved 2015-06-15. ^ Clarke JM, Ruedemann R. The Eurypterida of New York. ^ Weygoldt P, Paulus HF (1979). "Untersuchungen zur Morphologie, Taxonomie und Phylogenie der Chelicerata". Zeitschrift für zoologische Systematik und Evolutionsforschung. 17 (2): 85–116, 177–200. doi:10.1111/j.1439-0469.1979.tb00694.x. ^ "Horseshoe Crabs, Limulus polyphemus". MarineBio.org. ^ Palumbi, Stephen R.; Palumbi, Anthony R. (23 February 2014). The Extreme Life of the Sea. Princeton University Press. ISBN 9781400849932 – via Google Books. ^ "The biology of cartilage. I. Invertebrate cartilages:Limulus gill cartilage". ResearchGate. ^ a b Zaldívar-Rae, J.; Sapién-Silva, R.E. ; Rosales-Raya, M.; Brockmann, H.J. (2009). "American horseshoe crabs, Limulus polyphemus, in México: open possibilities". In J.T. Tanacredi; M.L. Botton; D.R. Smith. Biology and Conservation of Horseshoe Crabs. Springer. pp. 97–113. ISBN 9780387899589. ^ "About the Species". The Horseshoe Crab. Retrieved 26 June 2018. ^ T.C. Srijaya; P.J. Pradeep; S. Mithun; A. Hassan; F. Shaharom; A. Chatterji (2010). "A New Record on the Morphometric Variations in the Populations of Horseshoe Crab (Carcinoscorpius rotundicauda Latreille) Obtained from Two Different Ecological Habitats of Peninsular Malaysia". Our Nature. 8 (1): 204–211. doi:10.3126/on.v8i1.4329. ^ Azwarfarid Manca; Faridah Mohamad; Amirrudin Ahmad; Muhd Fawwaz Afham Mohd Sofa; Noraznawati Ismail (2017). "Tri-spine horseshoe crab, Tachypleus tridentatus (L.) in Sabah, Malaysia: the adult body sizes and population estimate". Journal of Asia-Pacific Biodiversity. 10 (3): 355–361. doi:10.1016/j.japb.2017.04.011. ^ "Horseshoe Crab (Limulus polyphemus)". WAZA. Retrieved 26 June 2018. ^ A. Raman Noor Jawahir; Mohamad Samsur; Mohd L. Shabdin; Khairul-Adha A. Rahim (2017). "Morphometric allometry of horseshoe crab, Tachypleus gigas at west part of Sarawak waters, Borneo, East Malaysia". AACL Bioflux. 10 (1): 18–24. ^ Lesley Cartwright-Taylor; Julian Lee; Chia Chi Hsu (2009). "Population structure and breeding pattern of the mangrove horseshoe crab Carcinoscorpius rotundicauda in Singapore" (PDF). Aquatic Biology. 8 (1): 61–69. doi:10.3354/ab00206. ^ Manton SM (1977) The Arthropoda: habits, functional morphology, and evolution Page 57, Clarendon Press. ^ Shuster CN, Barlow RB and Brockmann HJ (Eds.) (2003) The American Horseshoe Crab Pages 163–164, Harvard University Press. ISBN 9780674011595. ^ Vosatka ED (1970). "Observations on the Swimming, Righting, and Burrowing Movements of Young Horseshoe Crabs, Limulus Polyphemus" (PDF). The Ohio Journal of Science. 70 (5): 276–283. Archived (PDF) from the original on November 25, 2017. ^ Battelle, B.A. 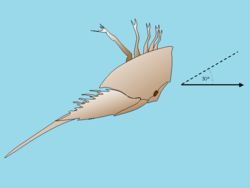 (December 2006), "The eyes of Limulus polyphemus (Xiphosura, Chelicerata) and their afferent and efferent projections. ", Arthropod Structure & Development, 35 (4): 261–74, doi:10.1016/j.asd.2006.07.002, PMID 18089075. ^ Barlow RB (2009) "Vision in horseshoe crabs" Pages 223–235 in JT Tanacredi, ML Botton and D Smith, Biology and Conservation of Horseshoe Crabs, Springer. ISBN 9780387899589. ^ "The Rabbit and the Horse Shoe Crab". September 23, 2014. Retrieved 2016-12-20. ^ David Funkhouser (April 15, 2011). "Crab love nest". Scientific American. 304 (4): 29. doi:10.1038/scientificamerican0411-29. ^ Yan Chen; C. W. Lau; S. G. Cheung; C. H. Ke; Paul K. S. Shin (2010). "Enhanced growth of juvenile Tachypleus tridentatus (Chelicerata: Xiphosura) in the laboratory: a step towards population restocking for conservation of the species". Aquatic Biology. 11: 37–40. doi:10.3354/ab00289. ^ Ruth H. Carmichael; Erik Brush (2012). "Three decades of horseshoe crab rearing: A review of conditions for captive growth and survival". Reviews in Aquaculture. 4 (1): 32–43. doi:10.1111/j.1753-5131.2012.01059.x. ^ Lenka Hurton (2003). Reducing post-bleeding mortality of horseshoe crabs (Limulus polyphemus) used in the biomedical industry (PDF) (M.Sc. thesis). Virginia Polytechnic Institute and State University. Archived from the original (PDF) on 2013-06-22. Retrieved 2011-04-18. ^ "Crash: A Tale of Two Species – The Benefits of Blue Blood – Nature – PBS". 10 June 2008. ^ The Blood Harvest The Atlantic, 2014. ^ Chesler, Caren. "Medical Labs May Be Killing Horseshoe Crabs". Scientific American. Scientific American. Retrieved 10 May 2018. ^ Chesler, Caren. "The Blood of the Crab". Popular Mechanics (13 April 2017). Retrieved 16 April 2017. ^ Chesler, Caren (June 9, 2016). "Medical Labs May Be Killing Horseshoe Crabs". Scientific American. Retrieved 2017-11-03. ^ Iwanaga, Sadaaki; Morita, Takashi; Miyata, Toshiyuki; Nakamura, Takanori; Aketagawa, Jun (1986-08-01). "The hemolymph coagulation system in invertebrate animals". Journal of Protein Chemistry. 5 (4): 255–268. doi:10.1007/bf01025424. ISSN 0277-8033. ^ "PyroGene : Licensing Success". National University of Singapore. 8 May 2003. Retrieved 2018-09-01. ^ Zhang, Sarah (2018-05-09). "The Last Days of the Blue-Blood Harvest". The Atlantic. Retrieved 2018-09-01. ^ "N.J. law protects horseshoe crabs". UPI. 25 March 2008. Retrieved 27 July 2018. ^ "Horseshoe crab". SC DNR species gallery. Archived from the original on March 31, 2016. Retrieved 2011-06-06. ^ 大西一實. "Vol.56 食うか食われるか?". あくあは〜つ通信. Archived from the original on 2003-08-13. Retrieved 2008-04-18. ^ "Red knots get to feast on horseshoe crab eggs". Environment News Service. March 26, 2008. Retrieved 2011-01-19. ^ "Critter Class Hodge Podge (Horseshoe crabs and Wooly Bears)" (PDF). The Wildlife Center. October 26, 2011. Retrieved 2015-03-09. ^ "Conservation". ERDG. Retrieved 2016-05-19. Chisholm, Hugh, ed. (1911). "King-Crab" . Encyclopædia Britannica (11th ed.). Cambridge University Press. Wikimedia Commons has media related to Limulidae. RedKnot.org links to shorebird recovery sites, movies, events & other info on Red Knot rufa & horseshoe crabs. Crab Bleeders Article about the men who bleed horseshoe crabs for science.